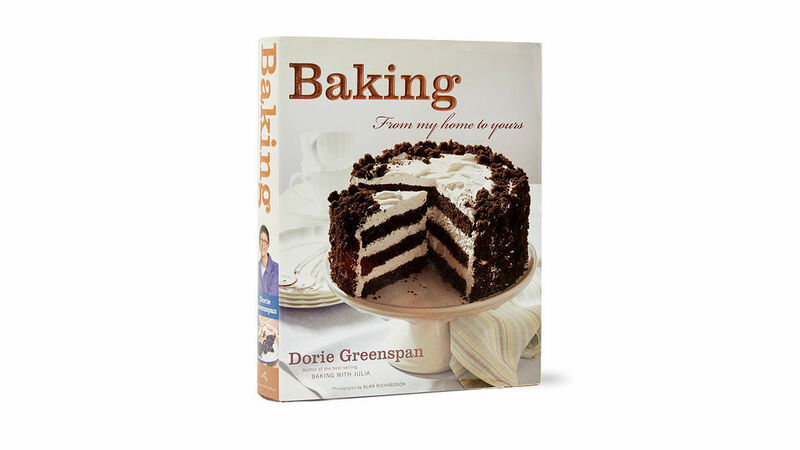 Dorie Greenspan’s Baking, from My Home to Yours is one of those books you know you must have as soon as you lay eyes on it. It’s an attractive tome with lots of big photographs and yummy recipes that make you want to tie on an apron and get baking. And it’s got weight, too. By that I don’t just mean that it feels nice and heavy; it also has an impressive encyclopedic breadth. The book covers everything from muffins, scones, and other breakfast sweets to cookies, cakes, pies, tarts, and “spoon desserts” (puddings, custards, crisps, and ice creams). There’s room in it for classics, such as Tarte Tatin, Pound Cake, and an All-American Apple Pie, as well as for more-unusual creations like Espresso Cheesecake Brownies and Fluted Polenta and Ricotta Cake. But Greenspan’s tone is anything but academic. She gives recipes happy titles like Chocolate Chunkers and Cranberry Upside-Downer, and along the way, she serves up a wealth of baking pointers—from how to get perfect pie dough to instructions for frosting layer cakes—with an amiable, reassuring voice that makes you feel that you have a baker friend at your side.